Global Live Casino is a very different type of online gaming site compared to most others: Instead of creating a virtual casino, this site aims to bring you as close as possible to accessing a real-life casino floor, by using a live feed from the Fitzwilliam Card Room in Dublin and the Palace Casino on the Isle of Man, and allowing you to take part in their games. Using the trademarked Distance Gaming technology from VueTec, you’re able to place your bets using a virtual playing environment, but the wheel or cards will be operated by a real life, flesh and blood croupier. There are other games to play here as well, using standard online gaming technology rather than live rooms, so if you fancy a trip to the slots, or a go on some non-standard table games then you’ll still be catered for. Global Live is really all about the live dealer games. These are – as you’d expect – roulette, Blackjack and Baccarat, though there’s also a Texas Hold ‘Em-themed table poker game as well. The Isle of Man roulette games are open at peak times, whilst the two wheels in Dublin are open 24/7, and stakes range from 50p up to £10 a spin. Each casino has one Baccarat table, both with the same stake limits as the roulette, whilst the Blackjack and table poker games are both broadcast from Dublin at weekends only, with stake limits of 50p/£25 and £1/£200 respectively. If that’s not enough to keep you busy, there are 28 virtual slots and 11 virtual table games as well. The multi-line slots come with fairly standard wild, scatter and bonus rounds, though it’s fair to say that you won’t find them at virtually any other casino. The remaining table games include Sic Bo, Casino War, Grand Slam, Texas Hold ‘Em Bonus and 3-5-7 Poker, plus some virtual versions of games that you can play live in the same casino – which seems a strange addition given GlobalLive’s USP, though maybe some players are apprehensive about playing live and want to practice first. There are 3 or 4 casinos using Distance Gaming’s service now, and it works well. There are lots of ways to customise the visuals and sound, and the overall effect is very engaging: Watching real punters approach the tables amid the buzz of conversation from all the other players and dealers makes for a very different experience from the usual ‘live’ casino setup of playing with a Latvian or Estonian croupier in a fake casino with no visible players. There’s no need to download anything either – it can all be done using instant play. Outside of the live rooms and virtual games, Global Live exudes quite a classy feel with very simple navigation. The way it’s laid out makes it easy to forget that there are other games apart from the live rooms, and you get the impression they’re really only there to beef up the numbers, though to be honest there’s no need. Just the four live games would be enough as playing here is such a unique experience. There’s no VIP system, although reloads are always given bonuses of either 10% or 15%. Global Live accept Visa (debit/credit/Electron), Eco, Mastercard, ClickandBuy, Neteller and Skrill. 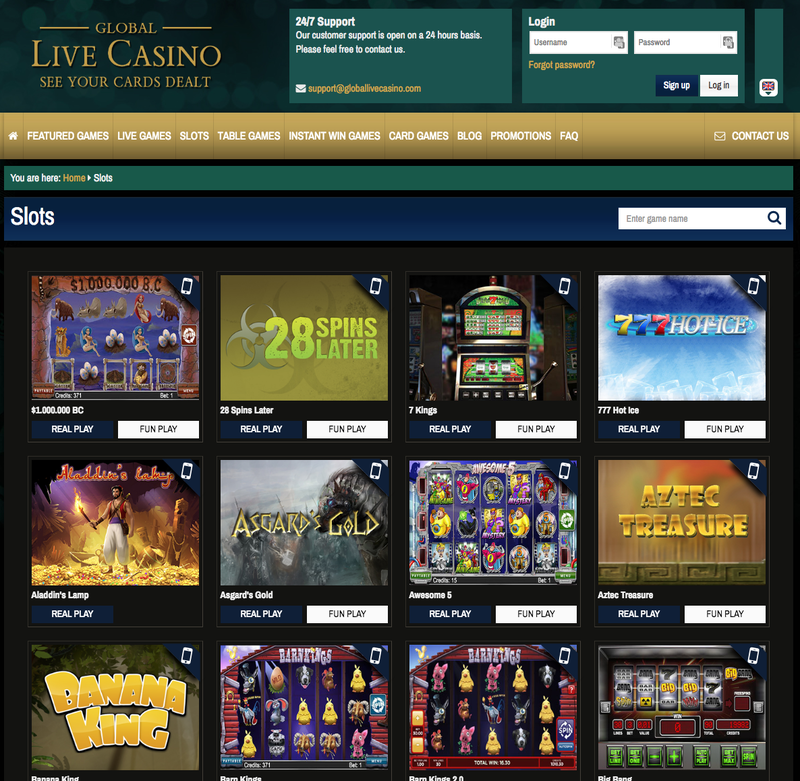 The live games at this site are not dependent upon random number generators, but are subject to standard regulatory casino checks from the authorities in the Isle of Man and The Republic of Ireland. Global Live Casino is owned and operated by VueTec (IoM) Ltd, and regulated by the Curacao jurisdiction.